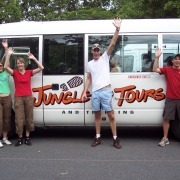 Cape Tribulation is a very special area of natural beauty, and an area that is a must visit on all holiday itineraries. The coastline comprises of deserted beaches framed by lowland rainforest, mangroves, eucalypt forest and wetlands. Crystal clear creeks and waterfalls flow out into the ocean. 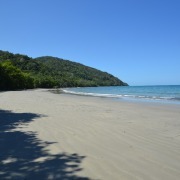 Thornton beach to Cape Tribulation beach is fringed with the increasingly rare littoral (beachside) rainforest and interesting fringing reefs, and is renowned as the place where where two spectacular World Heritage sites meet - the Daintree Rainforest and the Great Barrier Reef. 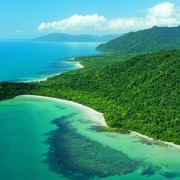 Cape Tribulation is part of The Daintree National Park which is the oldest, continuously surviving rainforest on earth. For active adventurers why not view the rainforest from another persective. Jungle Canopy Surfing is your opportunity to gain a bird's eye view of the rainforest over the treetops, down to cascading streams and out to the Great Barrier Reef. This family fun adventure is suitable for all ages from 8 years old. Fly through the trees on flying fox ziplines, stop at five different platforms and view the beauty of the rainforest from above and below. 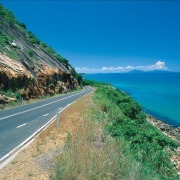 Experience diverse scenery as you travel through one of Australia’s most scenic coastal drives from Port Douglas along the Daintree-Cape Tribulation coast to one of Australia’s most historically significant townships. 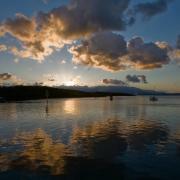 Rich in histroy, Cooktown is a small frontier town situated at the mouth of the Endeavour River. This small coastal town is where Lt James Cook found safe haven in 1770 to repair his ship, the “HM Bark Endeavour”, hence how the river was named. This is an area also rich in Aboriginal culture, where the First Reconciliation took place between Europeans and the Guugu Yimithirr people. The Cooktown 4WD Adventure will take you on a journey through spectacular wet tropical rainforest on the coastal road via the Bloomfield track to Cooktown followed by a return along the inland road, the Mulligan Highway, that will take you through diverse landscapes of cattle stations, bushland and lush valleys. Cape Tribulation in a Day! To really appreciate the untouched beauty that is World Heritage protected, you must see it from the air. Quicksilver Helicopters guarantee the most exhilarating and unique way of experiencing a birds eye view of Tropical North Queensland's spectacular icons. Choose from a 30 minute scenic rainforest flight which includes breath-taking views of Mossman Gorge, the Great Dividing Range and Daintree River; a 40 Minute Deluxe Reef Scenic flight wil give you a bird's eye view of the reefs and island's of Port Douglas and its surrounds. A 60 Minute Deluxe Reef & Rainforest scenic flight encompasses the finest our region has to offer, from reef to rainforest you will marvel at the kaleidoscope of colour and unsurpassed tropical icons. 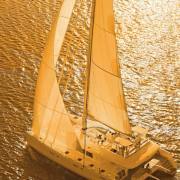 Relax and soak up the peace and sensational backdrop that surrounds you on a gentle sunset cruise. 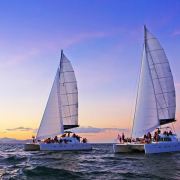 Watch the sunset over the mountains of the Daintree Rainforest and indulge in pure relaxation as you gently sail through the Dickson Inlet of Port Douglas and out over the Coral Sea. 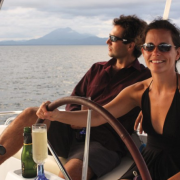 A 1.5 hour sunset cruise includes a complimentary glass of champagne, wine or beer and a selection of canapés. 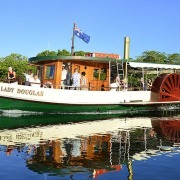 Alternatively take a calm water sunset cruise along the Daintree River. 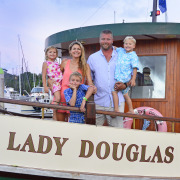 Join Andy for a personalised 2 hour Sunset cruise where you can sit back and enjoy the commentary or take photos of the wild beauty of the Daintree Rainforest. This cruise is ideal for bird lovers as the evening departure is timed to coincide with peak bird activity and to give the photographers the best natural light. Daintree River Experience cruises are longer than most - 2hrs - allowing time to explore one or more of the Daintree River's beautiful tributaries to maximize your chances of seeing the more.